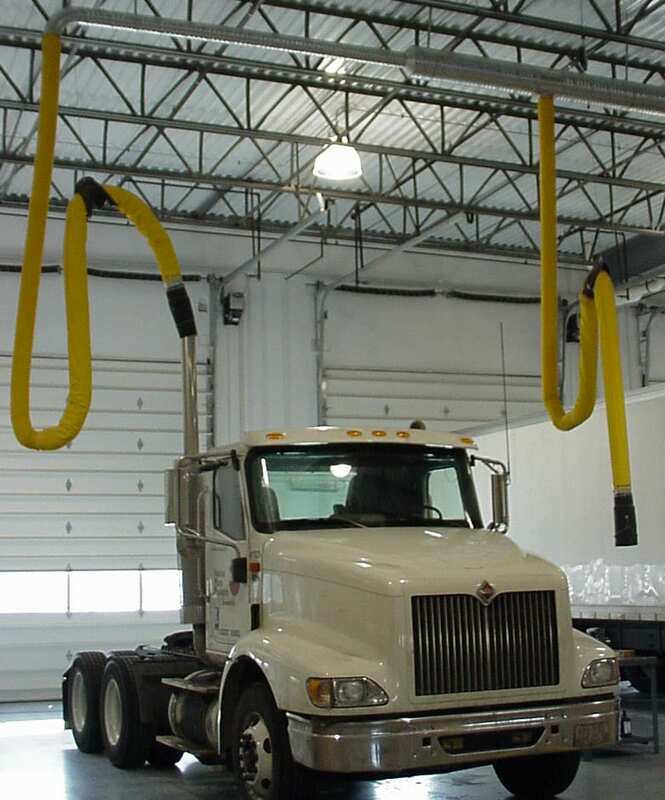 We are recognized as the industry leader in manufacturing vehicle exhaust systems because of our product diversity, unmatched durability, extensive service network, and experience. We’ve offered the best, American-made products since 1946. Browse the Harvey product catalog. The Harvey model #TS-30 is “TELESCOPICALLY®” designed to simplify and improve upon existing overhead exhaust drops currently available. 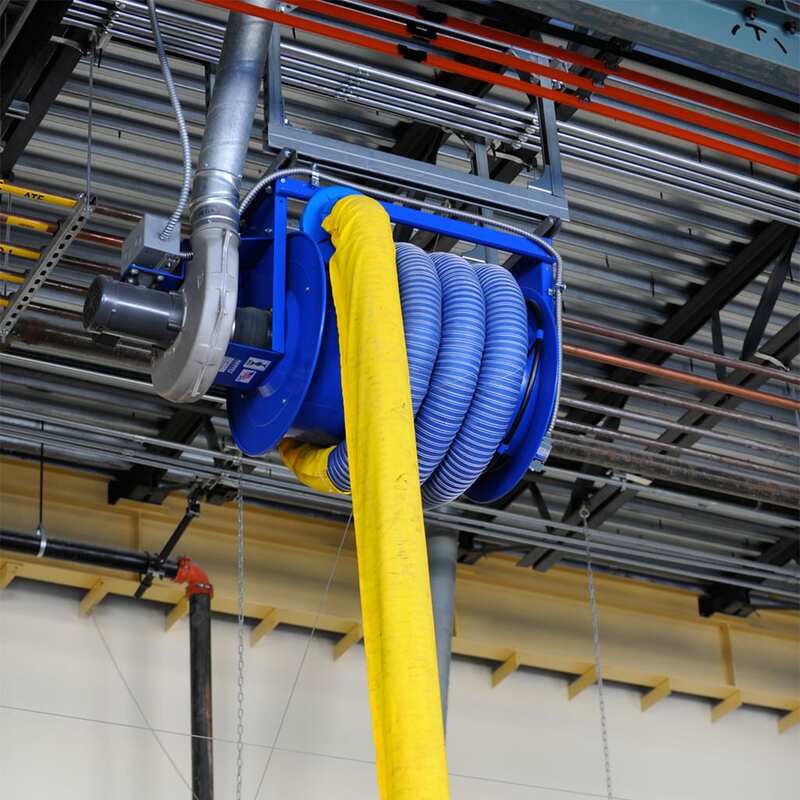 The #TS-30 consists of three lengths of lightweight, flexible tubing that slide one into another and give the appearance of only one 6’ length of tubing attached to the overhead duct. 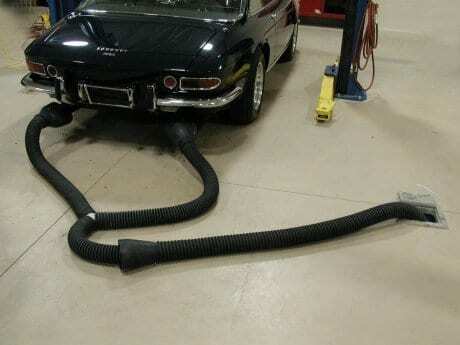 The tubing and tailpipe adapter that connect to the vehicle are non-crush, neoprene rubber. Drive over it! The tubing and adapter cannot be crushed or damaged. Pull-up sets are not required with the #TS-30 and #TS-40 drops. The HRX-812’s elliptically shaped aluminum rail allows for efficient airflow and sleek styling. 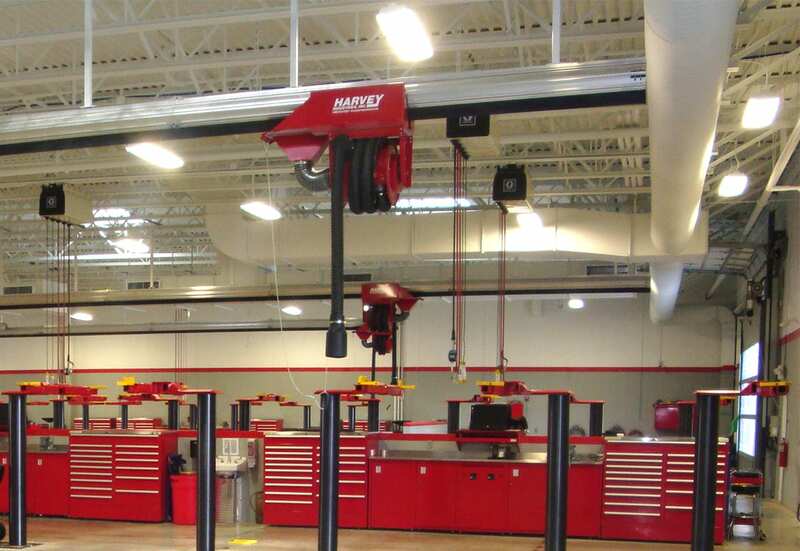 The easy-glide trolley assembly allows drops to be shared among bays (check state and local codes). It also features pinned joints to guarantee easy alignment of rail sections and our “Positive Pull” nut and bolt joining system with gasketed seams to ensure a simple, trouble-free installation. Trolley assembly can be fitted with the standard #TS-30 drop or the #3-Skyhook balancing pull-up configuration or any of the RHR series hose reels. The heavy duty trolley assembly is fitted with eight ball bearing wheels for smooth operation. Rail systems also available for heavy duty transit truck/bus or industrial applications. 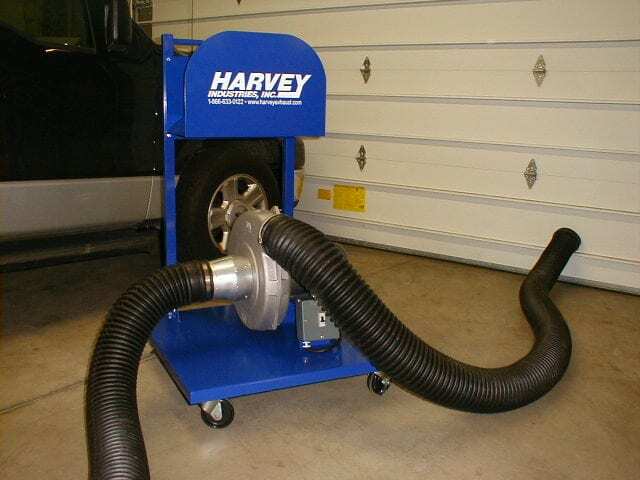 The Harvey Automatic Retractable Hose Reel offers one of the most convenient methods available for extracting harmful exhaust fumes and gases from all types of service areas. 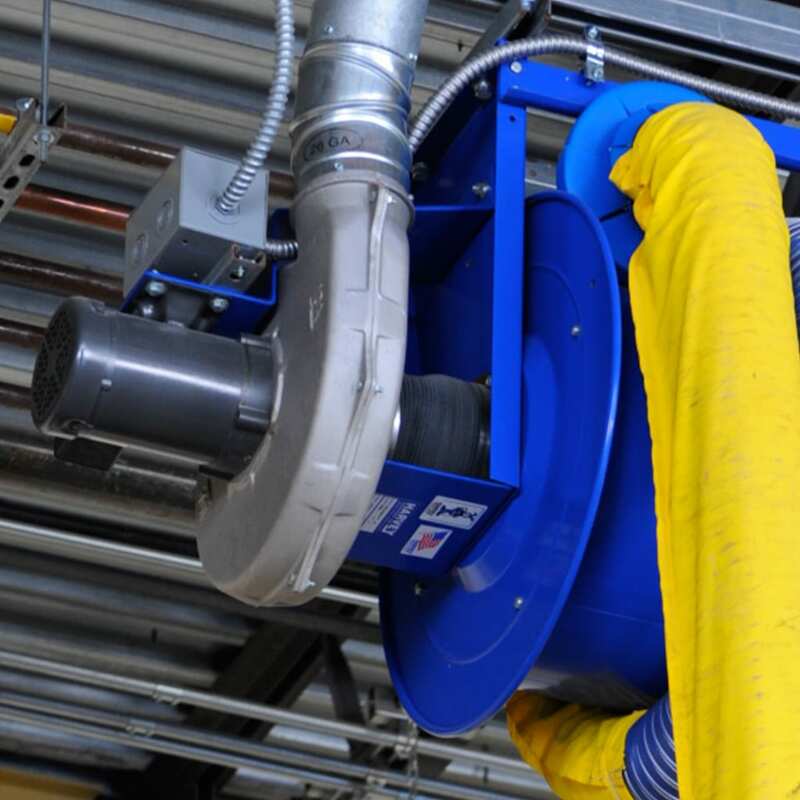 The carbon spring-operated hose reel is designed for years of trouble-free service and can be adapted for use with ALL types of vehicles. 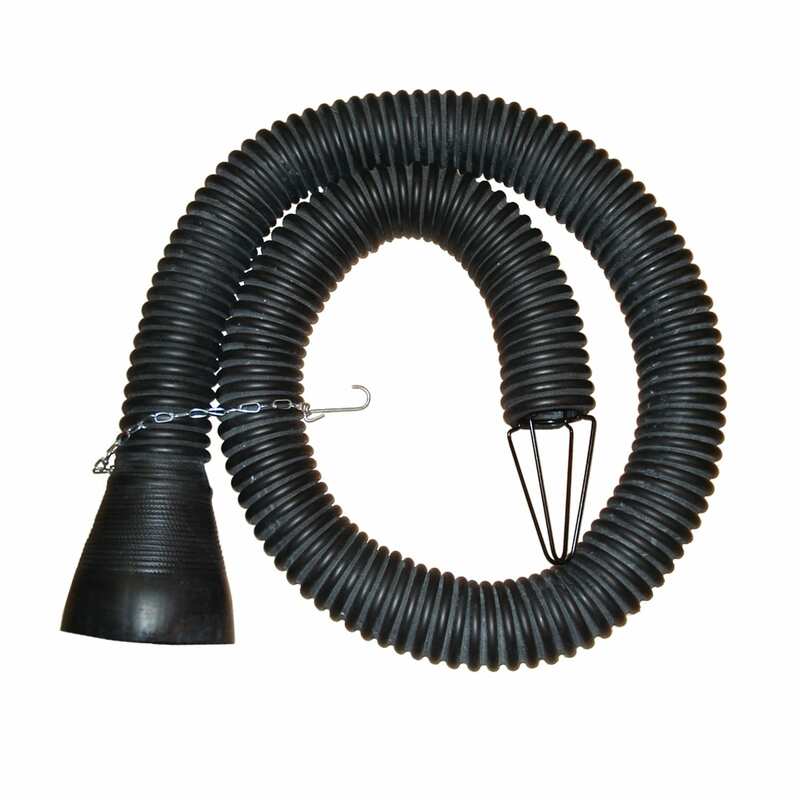 The exhaust hose supplied with the reel is fabricated of Silicone Fiberglass with an internal wire helix and rubber coated. It is high heat resistant to 600 degrees and meets U.S. military and commercial specifications as well as United States Air Force requirement for high temperature stability. Custom hose lengths are available upon request. 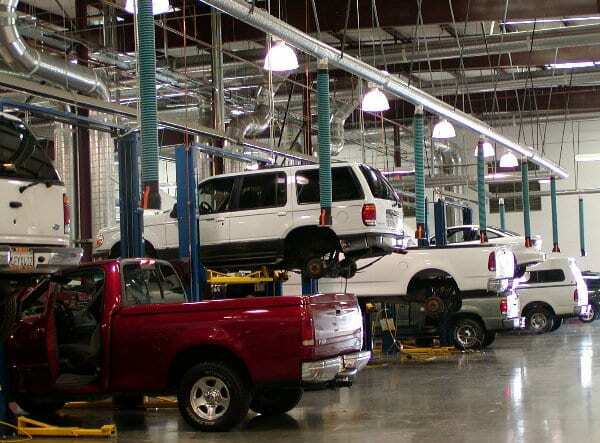 An overhead system is easily installed in an existing or new building. 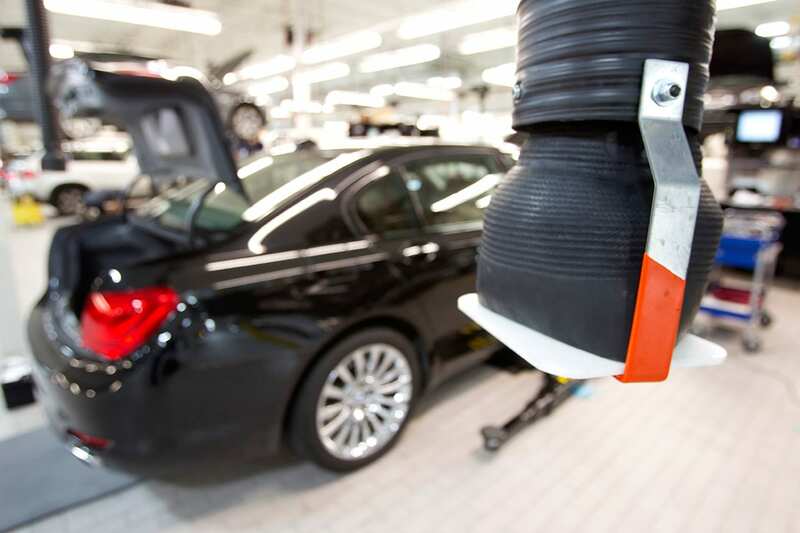 A single drop is normally located at the side of the stall approximately 1’ behind the rear vehicle bumper. 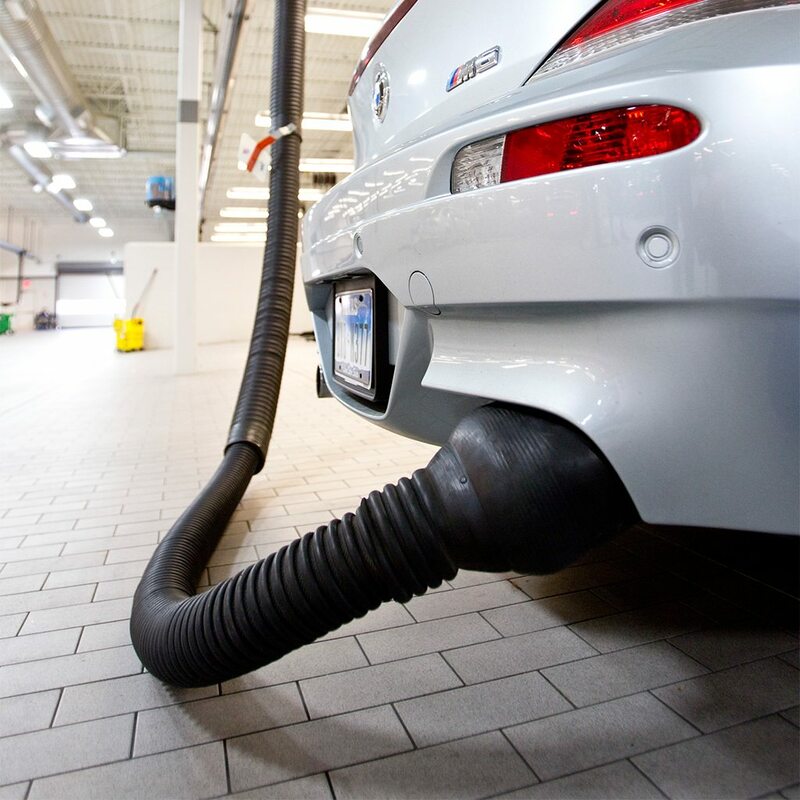 The ductwork should be at an elevation of 15’ to 16’ A.F.F., which would then allow the standard 20’ hose drop to attach to either right or left side mounted tailpipes. 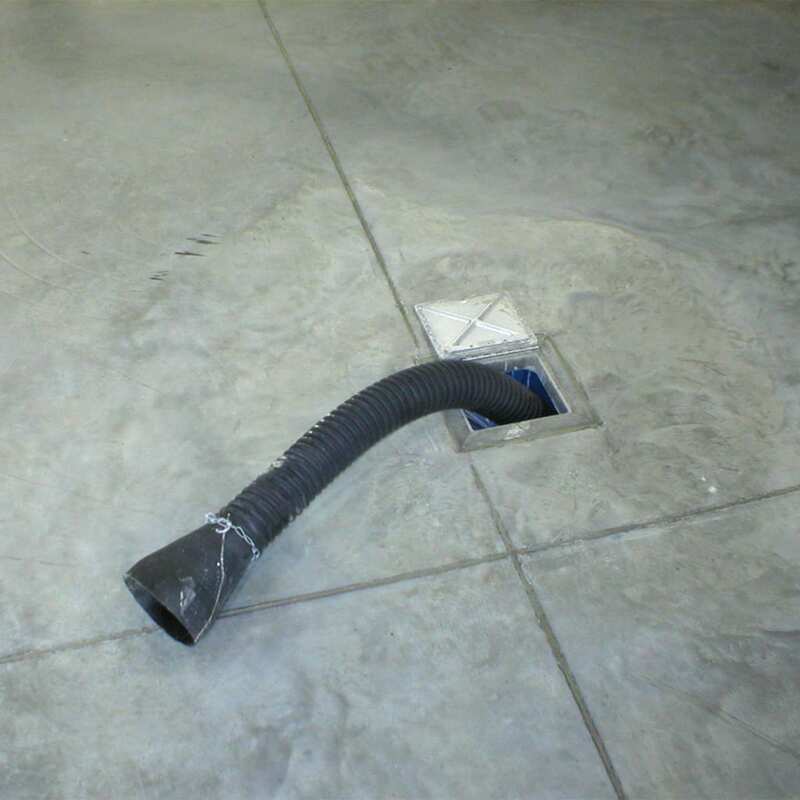 An overhead drop is installed by slipping the overhead coupler over the appropriate size stub or airflow “T” of the ductwork. The overhead coupler is held in place with a bolt through the assembly. 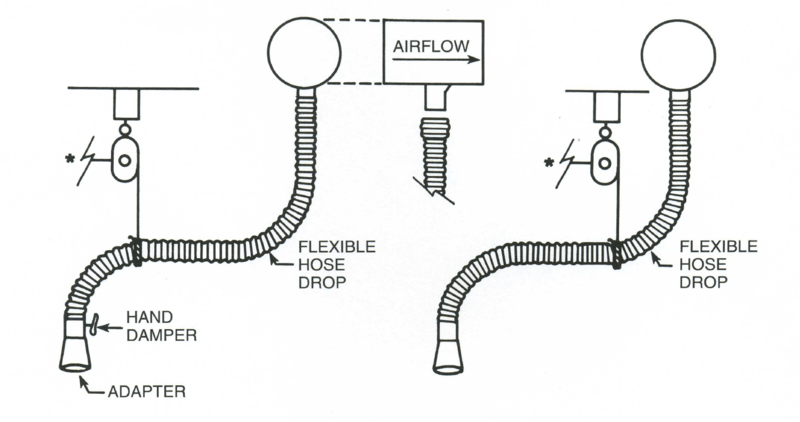 For dual exhaust vehicles, a “Y” harness should be used in conjunction with the overhead drop. 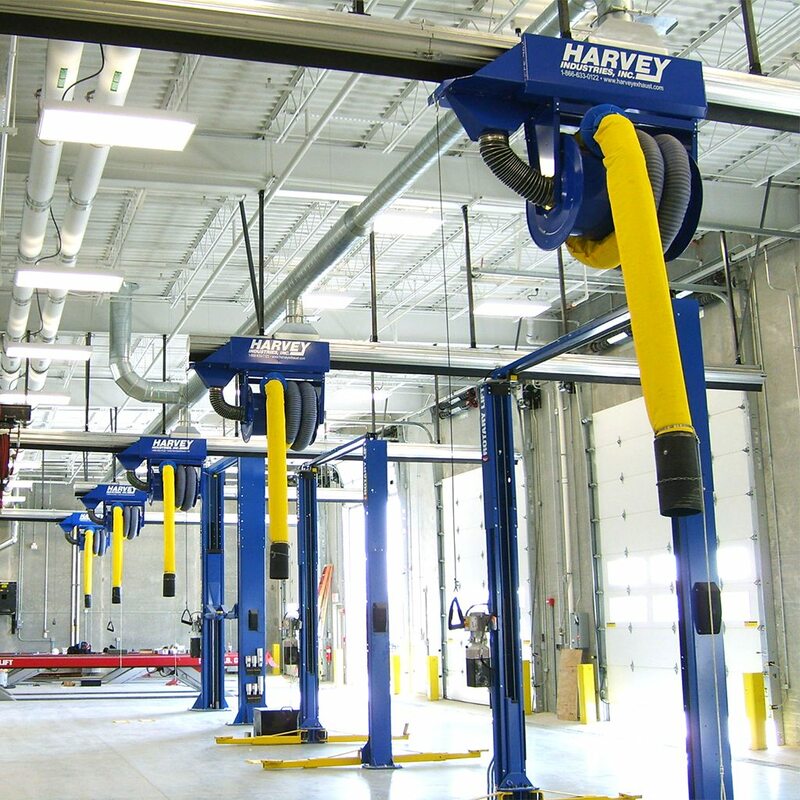 Various types of pull-up sets are available to retract hose drops when not in use, such as Harvey’s No. 1, 2, 3, or 4 Skyhooks. The body of the PS Floor Fitting is plastic molded from high-temperature resistant polyethylene. 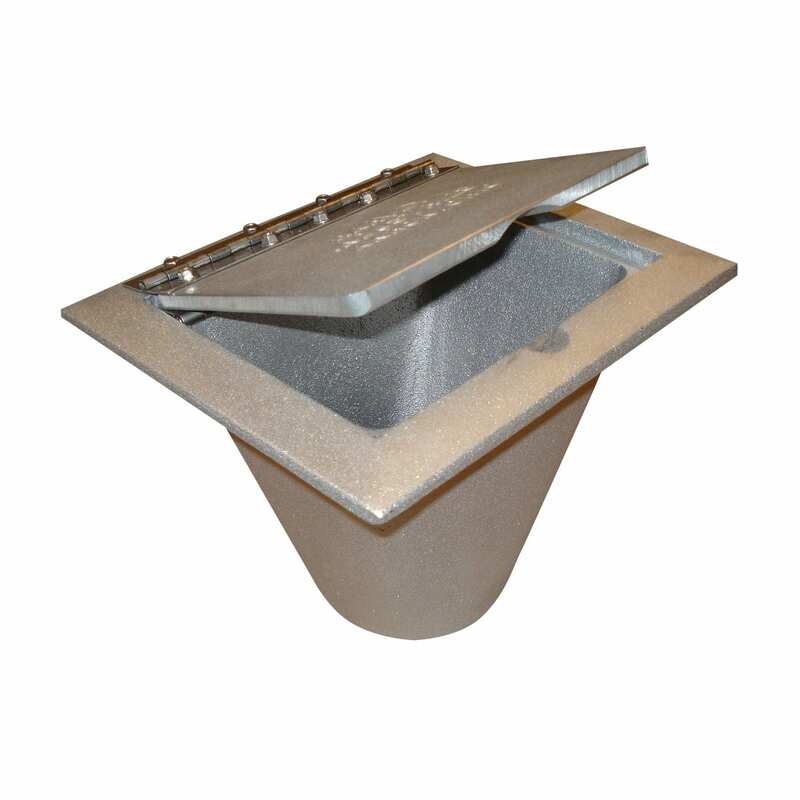 The top flange and lid of the PS Fitting is cast aluminum with the 5/16” thick lid having a tensile strength of 35,000 pounds. The lid is attached to the flange with a heavy-gauge, all stainless steel piano hinge for easy maintenance. When in the open position, the lid rests solidly on the floor. 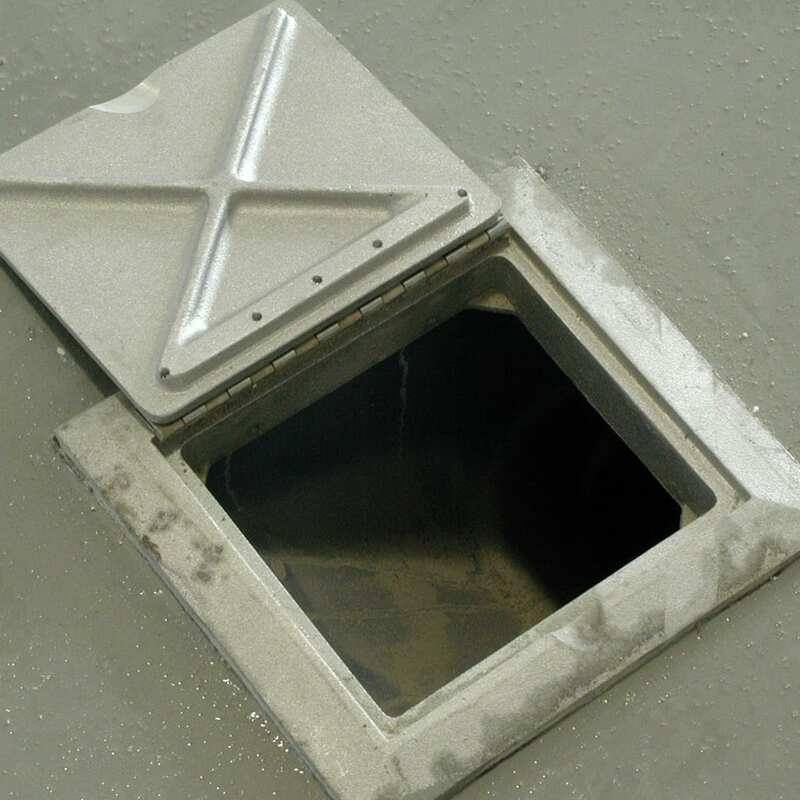 The molded plastic Floor Fitting offers reduced costs and is impervious to all the elements for years of trouble-free service. 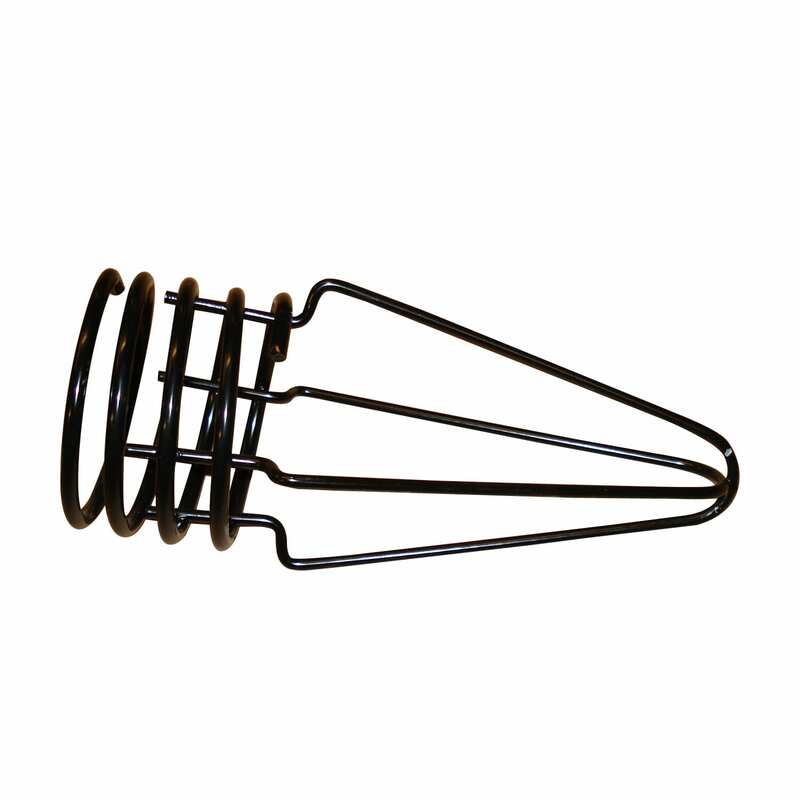 The base is designed to fit the Harvey Molded Plastic Pipe Saddle, which allows for approximately 4” height adjustment. Housings, wheels, and frames are welded providing heavy construction and assuring solid, rattle-free units. Wheels are supported by heavy cast iron hubs and are static and dynamically balanced. Belt drive units are equipped with variable speed drives. Clockwise rotation wheel and bottom horizontal discharge housing is standard. Discharge may be changed to any one of eight directions at job site or specified on order. 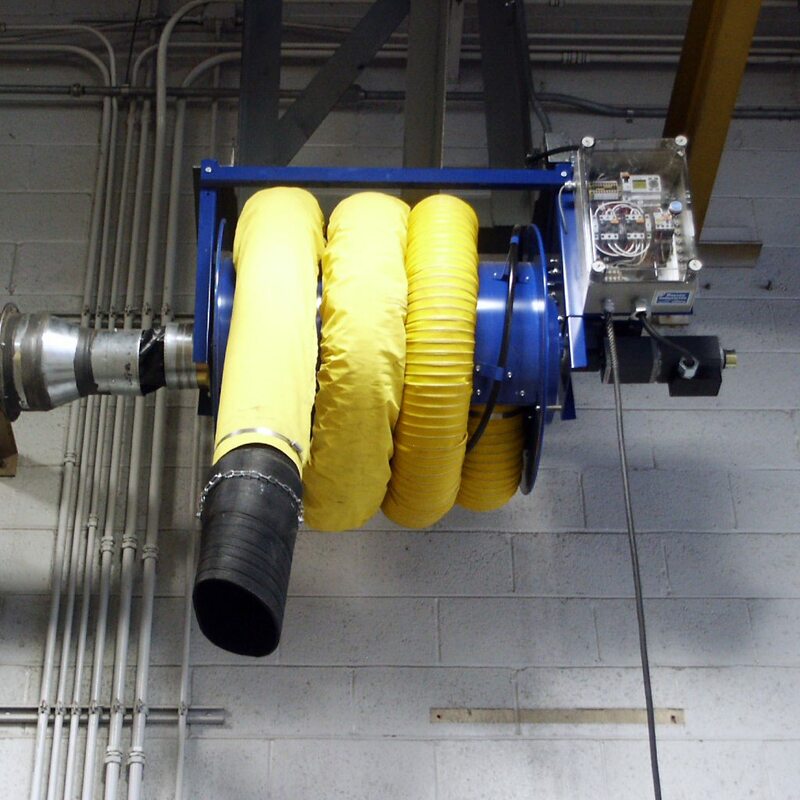 Direct drive, BD-7 and BD-8 belt drive blowers are either forward curve or radial blade. All other belt drive blowers are backward curve. All blowers comply with AMCA Standard 210 and bear the AMCA Seal. Should any failure due to defective workmanship or material occur within 12 months from date of shipment, replacement of defective part only will be made promptly without charge. This warranty does not cover ordinary wear and tear, abuse, misuse, overloading, altered products, or materials not of seller’s manufacture. 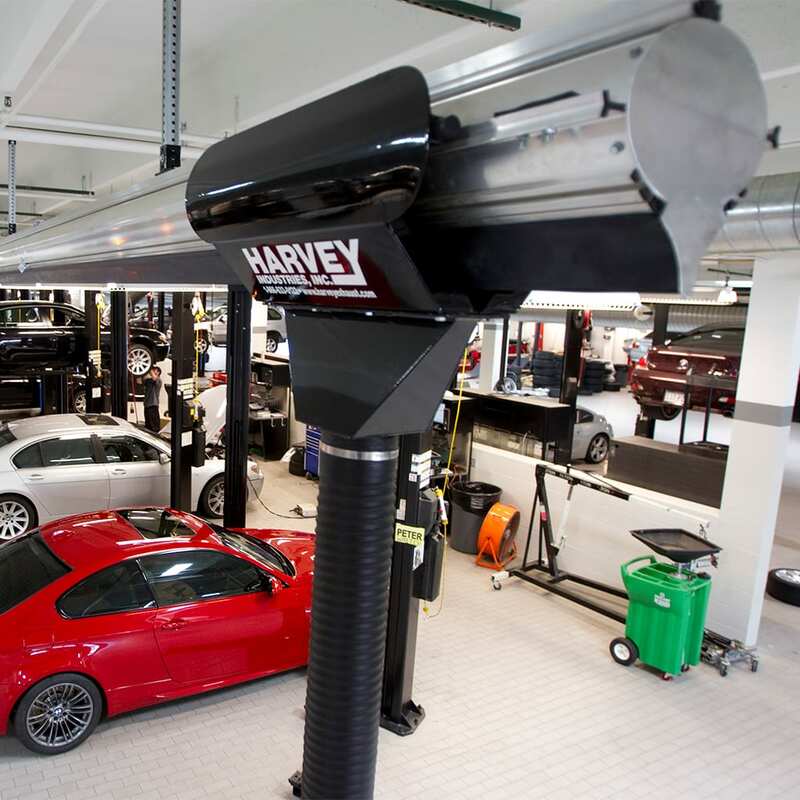 The Harvey Thru-The-Door System is designed for service stations and garages where the door is directly behind the vehicle. 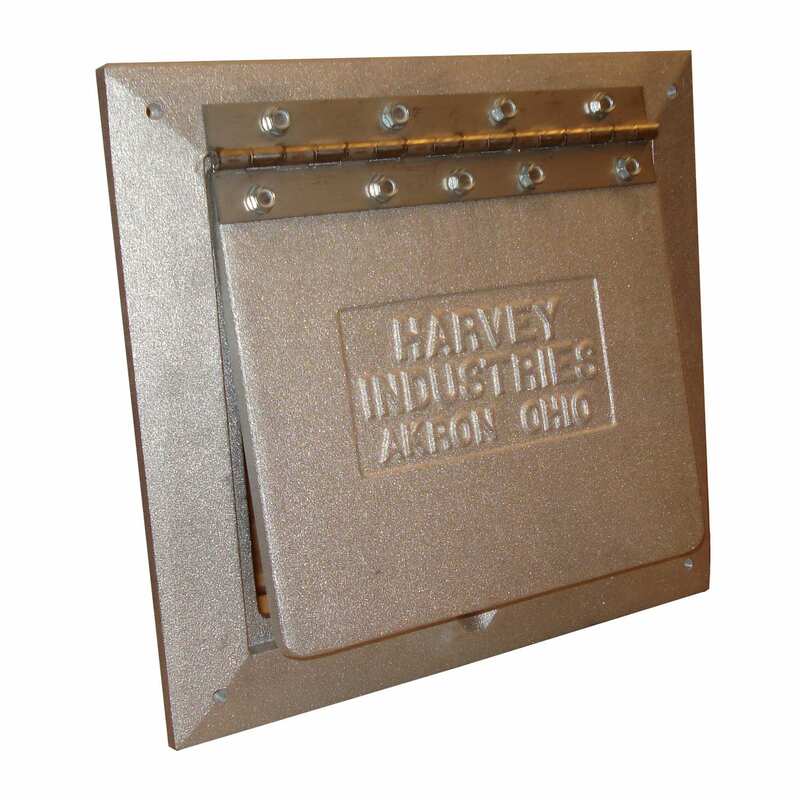 Harvey Door Ports are all cast aluminum for years of trouble-free service. They are supplied with all hardware necessary for installation. 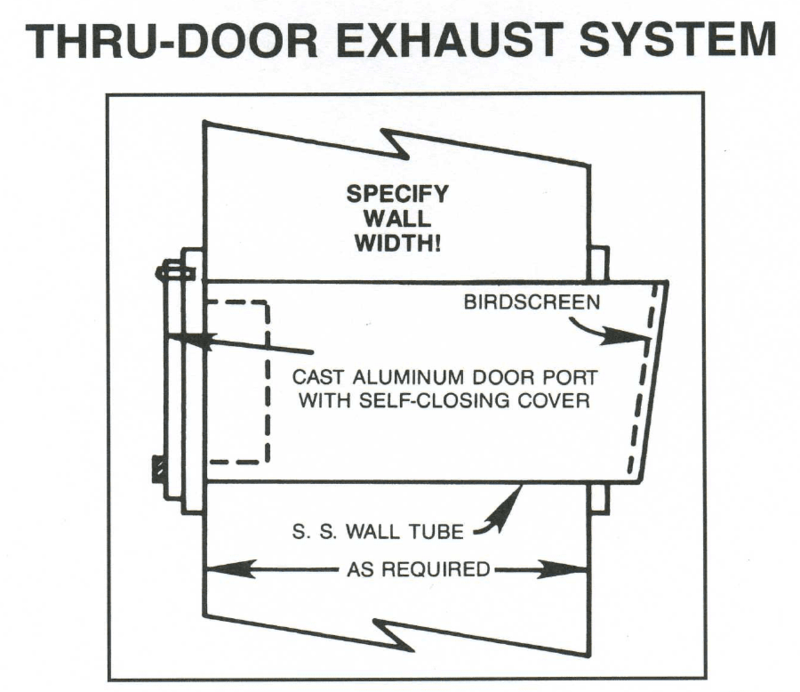 Thru-Wall Exhaust Systems are offered for installations requiring wall ports in place of door ports. Stainless steel wall tube assemblies are available for this application. Harvey “Twist-Lock” hose represents the latest advancements in technology and fabrication of rubber hose for our industry. Under normal service conditions, the hose is heat resistant in excess of 550℉. 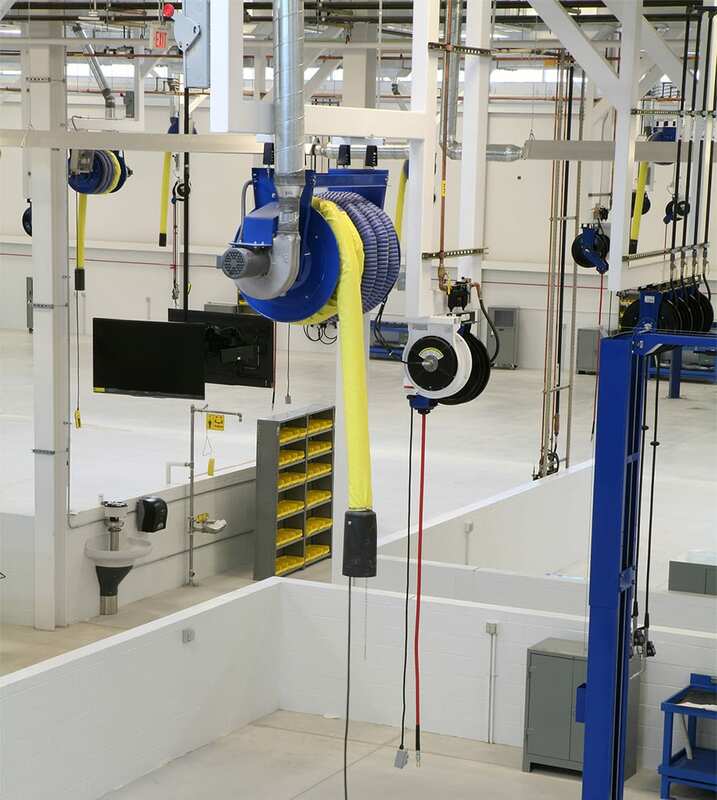 The “Twist-Lock” feature enables an individual to connect several lengths of hose together without the use of couplers. Note: rubber hose is not recommended for Dynamometers. 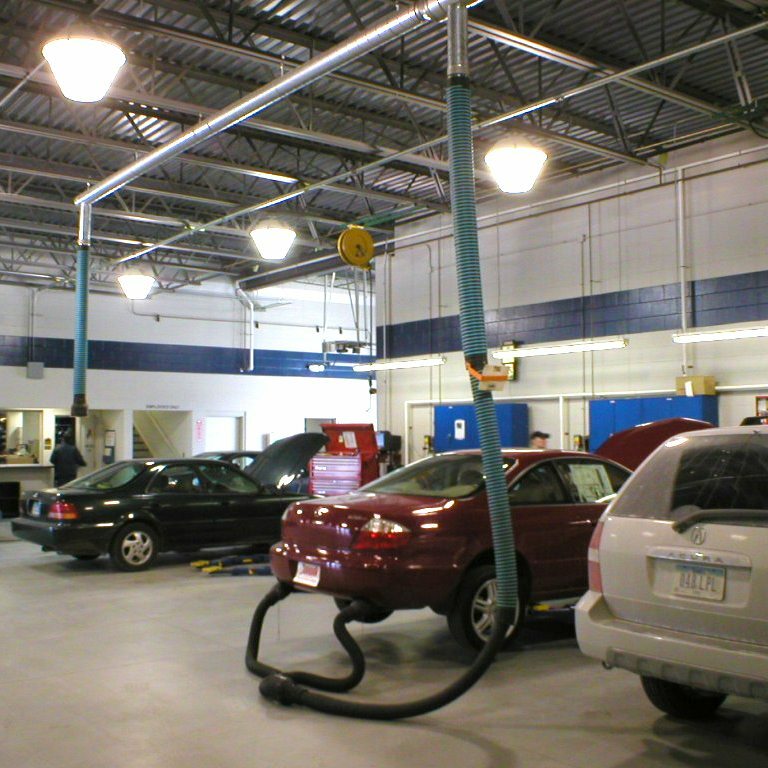 To avoid continual replacement of exhaust hose, tailpipe adapters should be used. Harvey tailpipe adapters are available for all sizes of hose and tubing and are manufactured in rubber and stainless steel. 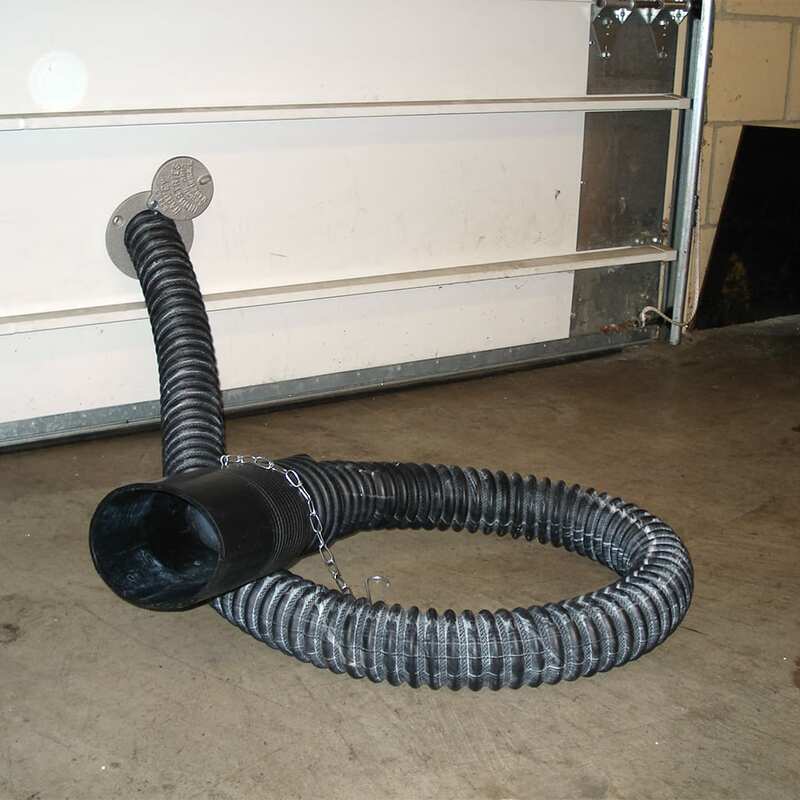 A-Smooth bore mounting base for use with smooth bore hose. For use on vehicles with flush mount or recessed tailpipes. 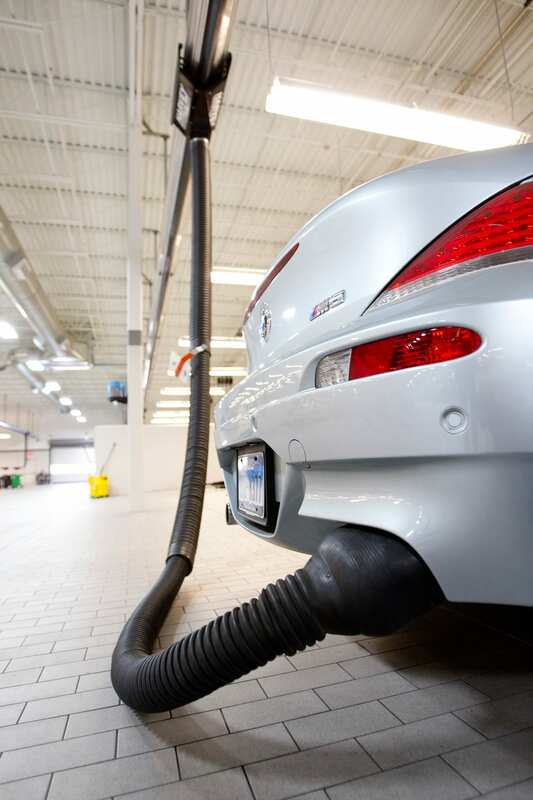 The wire form is installed in the tailpipe adapter and the flexible metal bar is inserted into the tailpipe to hold the hose and tailpipe adapter in place. Specifically for rubber, silicone fiberglass, or metal tubing. Cast aluminum hose coupler used to connect various lengths of rubber hose when “Twist Lock” feature not available. Standard with all Harvey underground units. The hose guide serves two purposes: to guide the rubber hose easily through the underground system and to prevent rags, etc. from being sucked into the system. Also available for metal tubing. Old style floor fitting, replacement units available. For use in “Y” harnesses. 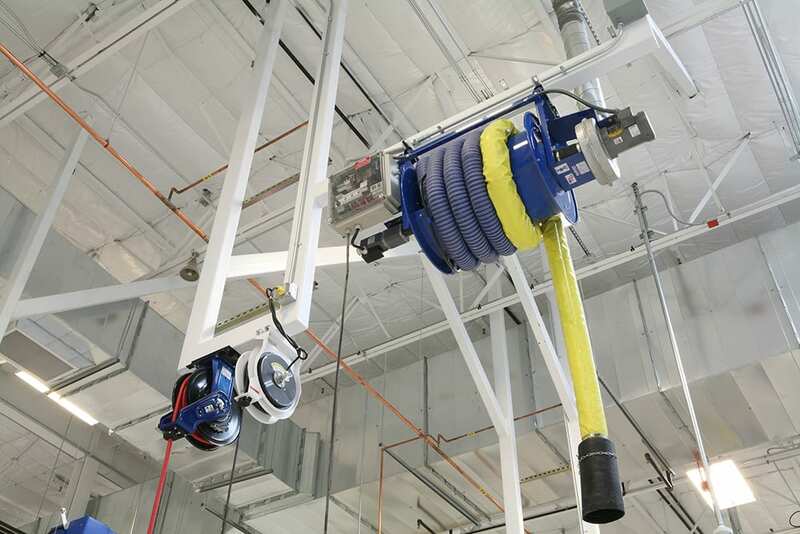 Mounted in the hose drop of an overhead system to cut off the majority of air flow when not in use. Cast aluminum elbow joins two hose lengths and eliminates kinking of hose when pulled up out of the way. Used in place of damper. 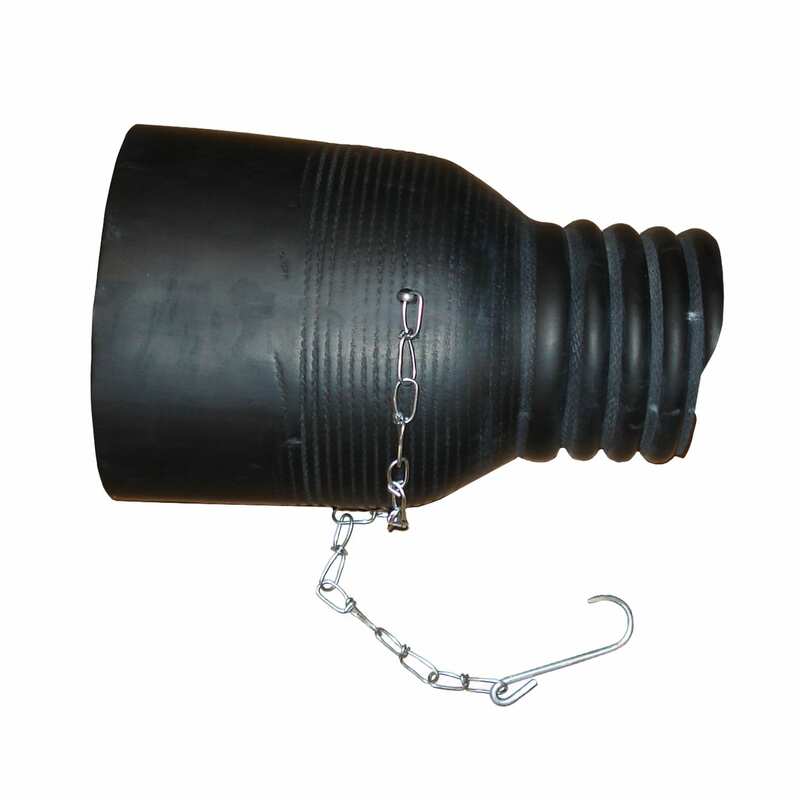 Harvey Overhead Duct Couplers simplify installation of overhead rubber drops. One end of the cast aluminum coupler threads into the rubber hose and the other end slips over stub of the duct work. A bolt through the assembly completes installation of the overhead drop. 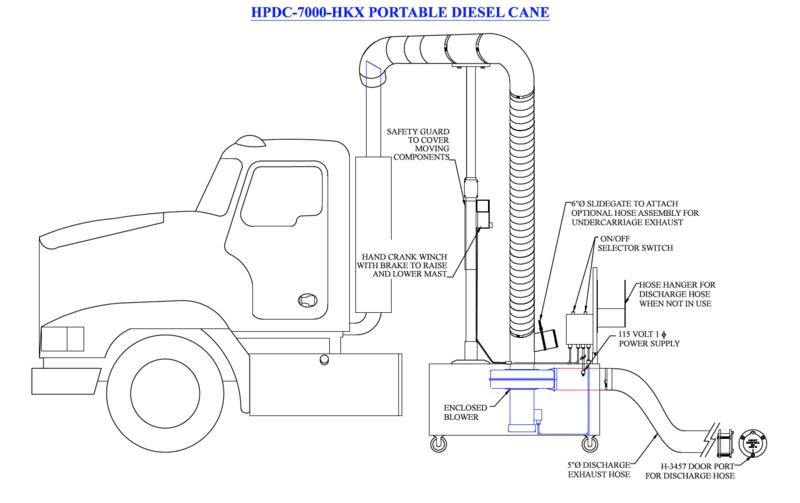 Harvey Industries designs and build a complete line of exhaust extraction equipment for any heavy duty applications. Please contact the factory or your local rep for assistance in the design of any custom configuration.